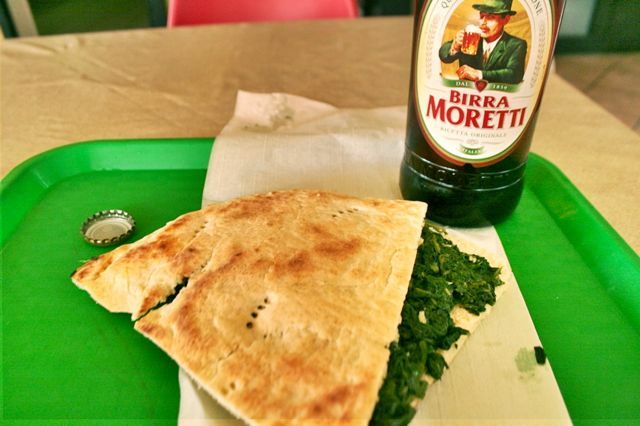 Torta al Testo is an Umbrian flat bread that you will often find served as part of a mixed antipasti. It is cooked in an oven on a round hot stone and served sliced like pizza but split down the middle and filled, usually filled with a combination of either ham, sausage, vegetables and cheese. Some places specialise in torta al testo, I stopped at a restaurant on the south east corner of Lake Trasimeno for a quick lunch where I took this photo. If you need something to eat and are in a hurry I recommend you try a slice of torts al testo, it also makes a great alternative to the standard unsalted bread that is usually served in Umbria and Tuscany.